This is an American classic and this version is just about the best one I’ve ever tasted. A devil’s food cake should be very chocolaty and also very moist, two qualities that don’t often coincide. The icing is easy to make – I’ve simplified the method. In the past, it was prepared like a cooked meringue in which the egg whites are whipped and hot sugar syrup is poured over them. The method here combines all the ingredients and heats them over boiling water – it’s faster and more reliable. For the cake batter, in a mixing bowl, stir together the sugar, flour, salt and baking soda and set aside. Place the cut up chocolate and butter in a bowl and pour the hot coffee over it. Let stand while the chocolate melts. Whisk the chocolate, butter, and coffee smooth and whisk in the eggs until liquid, vanilla extract, and sour cream, one at a time. Whisk the flour mixture into the liquids a third at a time. Divide the batter equally between the prepared pans and smooth the tops. Bake the layers until they are well risen and feel firm when pressed in the center with a fingertip, about 25 to 30 minutes. Cool in the pans on racks for 5 minutes, then unmold, turn right side up again and cool completely. Regulate the heat under the pan of water so that it boils gently and place the bowl on the pan. Whisk gently just to keep the mixture moving until it is hot (about 140 degrees) and all the sugar is dissolved. Place the bowl on the mixer with the whisk and whip the icing until it has cooled and become white and fluffy. My friends at Guittard Chocolate have new Fair Trade Certified baking bars that are great for cakes, desserts, cookies, and even a furtive munch or two. They come in 6-ounce packages and they're ideal for the recipes below. There are 100% unsweetened, 70% bittersweet, and 64% semisweet chocolates in the new Collection Etienne. Visit the Guittard website for more information and by all means, try one of the recipes here with them. Marble cakes are both homey and festive at the same time. 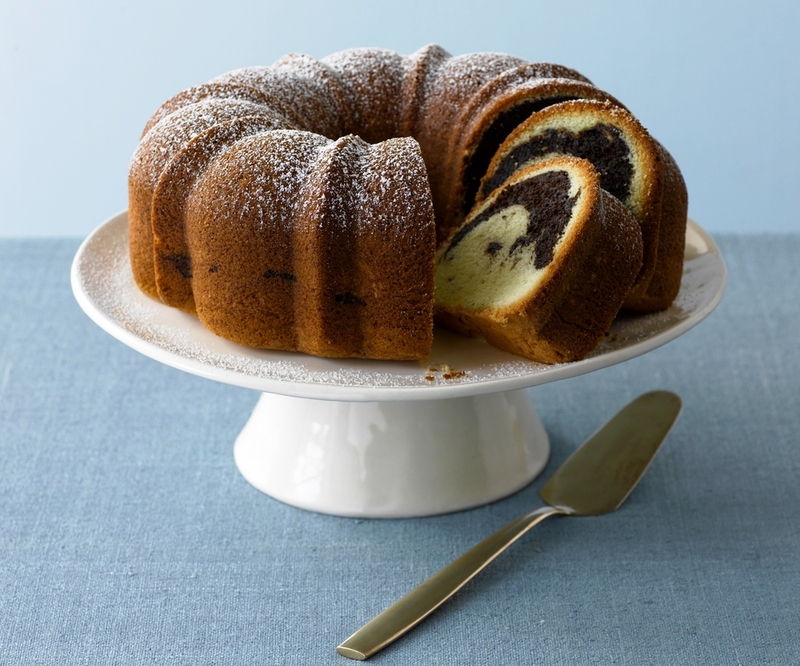 A marble cake looks slick when you slice into it and reveal the delicate pattern of the two batters swirled together. My first experience in working with this type of mixture came about as the result of a marbled chocolate terrine that appeared first in the pages of the old Cook’s Magazine, and then in my chocolate book. Everything about it was right – the texture, the flavor, the quantity of mixture in relation to the mold – everything that is, except the marbling. Even when I hardly mixed the white and dark chocolate mixtures at all, what I got was a few streaks of dark and white, and mostly a muddy combined color. After several frustrating attempts I realized that I had too much dark chocolate mixture and re-cast the recipe so that there was twice as much white chocolate mixture as dark and the terrine mixture marbled perfectly. So this marble cake is proportioned in the same way: rather than dividing the base batter in half, I like to remove about a third of it and add the chocolate. Thanks to my old friend Ceri Hadda who shared her mother’s recipe years ago. Set a rack in the lower third of the oven and preheat to 325 degrees. Combine the flour, sugar, baking powder, and salt in the bowl of an electric mixer. Stir well by hand to mix and add the butter. Beat the mixture on low speed with the paddle until the mixture is well mixed, about a minute or two. Whisk the eggs and rum together. On medium speed, beat a third of the liquid into the flour and butter mixture. >Beat for 1 minute. Stop and scrape the bowl and beater. Beat in another third of the liquid and beat for 2 minutes. Repeat step 4 with the last of the liquid. Remove the bowl from the mixer and use a large rubber spatula give the batter a final mixing. Combine the rum, milk, and baking soda in a medium mixing bowl and whisk well to dissolve the soda. Scrape in the chocolate and whisk it into the liquid. Add the 2 cups of base batter and whisk well to combine. Scrape half the remaining base batter into the prepared pan and smooth the top. Cover with the chocolate batter, making as even a layer as possible. Finally top with the remaining base batter and smooth the top. Use a wide-bladed table knife or a thin metal spatula to marble the batter: Insert the knife into the batter at the central tube with the wide side of the blade facing you. Draw the blade through the batter to the bottom of the pan and up and out the side of the pan closest to you, repeating the motion every inch or so around the pan, describing a spiral into the batter, almost as though you were folding egg whites into it. Stop when you get back to the point where you started. Don’t bother to smooth the top of the batter – it might disturb the marbling. Bake the cake until it is well risen and firm, and a toothpick or a small thin knife inserted midway between the side of the pan and the central tube emerges dry, about an hour. Cool the cake in the pan for 5 minutes then invert a rack on it. Invert and lift off the pan. Cool the cake completely. This is a wonderful make-ahead dessert. As long as everything to serve it is ready in advance, you may make the cake batter and fill the molds hours in advance -- just bake them immediately before you intend to serve them. Melt the butter in a saucepan over medium heat and let it get hot and start to sizzle. Off heat add the chocolate and let stand for a minute; whisk smooth. Stir the flour and sugar together in a bowl and whisk in the eggs all at once until smooth. Whisk in the yolks, followed by the chocolate and butter mixture. Fill the molds to within a quarter inch of the top. Bake for 10 to 12 minutes, (unmold one to see how liquid it is), then unmold onto warm plates. Serve with the sauce below. Combine milk, cream, sugar and vanilla bean and bring to a boil over low heat. Whisk yolks in a bowl. Whisk a third of the boiling liquid into the yolks, then return remaining liquid to a boil. Whisk yolk mixture into boiling liquid and continue whisking until thickened, about 15 seconds. Remove pan from heat, whisking constantly and strain into a clean bowl set over ice water. Stir occasionally until cooled.